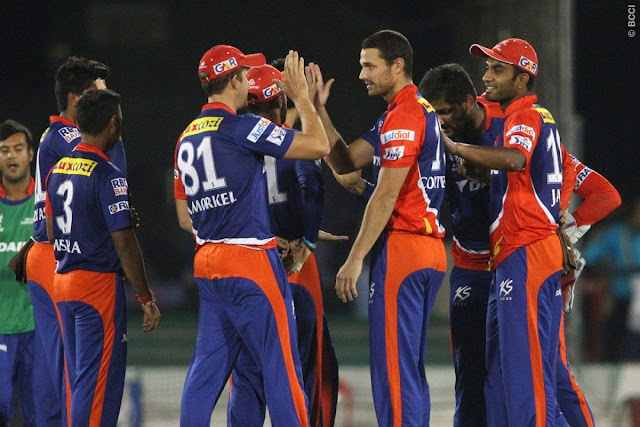 Sunrisers Hyderabad defeat Delhi Daredevils in a thrilling encounter and keeps their hope alive to reach the playoffs. A team with nothing to lose versus a team which has everything to gain, a team playing for pride while a team playing for a spot in the playoffs. Yes it is a battle between the team which has been down and out of the tournament I.E. Delhi Daredevils versus Sunrisers Hyderabad a team which has shown glimpses of good performance and will be hoping for the same at the later stages so that they can stay alive in this league. 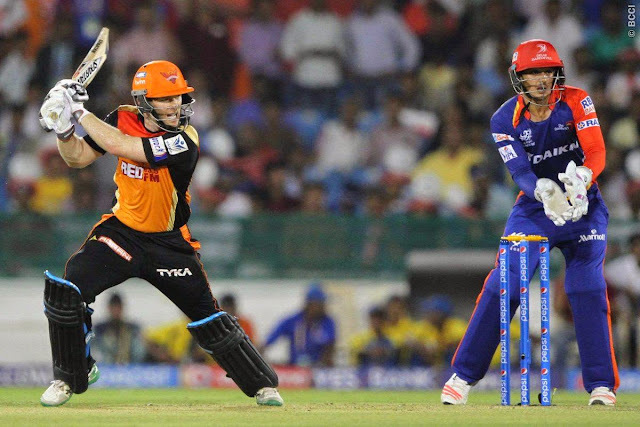 It was the 45th match of Pepsi IPL 2015 played at Raipur, home ground of Delhi Daredevils, Sunrisers Hyderabad won the toss and decided the bat first, hoping that the duo of Shikhar Dhawan and David Warner will provide the the same kind of the start which they have been providing so far in the tournament. But it didn't happen this time around as both of them lost their wicket one after another at the score of 32 in 5 overs. After these quick losses the innings went into a sluggish mode as both Henriques and Morgan struggled to score runs at a healthy pace and the score reached to mere 57 runs at the end of 9 overs. The middle part of the innings went more inactive as Amit Mishra and Jayant Yadav delivered a tight spell and in quest of scoring quickly Eoin Morgan Scooped the ball in the air which brought an end to the rather unpleasing innings of 22 runs of 25 balls. Moises Henriques looked like the only one which could help Sunrisers Hyderabad to post a competitive total as he continued to build on the scoring rate with little support from Karn Sharma who scored 16 runs of 13 deliveries. Sunrisers Hyderabad accelerated the scoring rate after the second strategic timeout thanks to some lusty blows from Henriques, well supported by Ravi Bopara who gave him as much strike as possible. 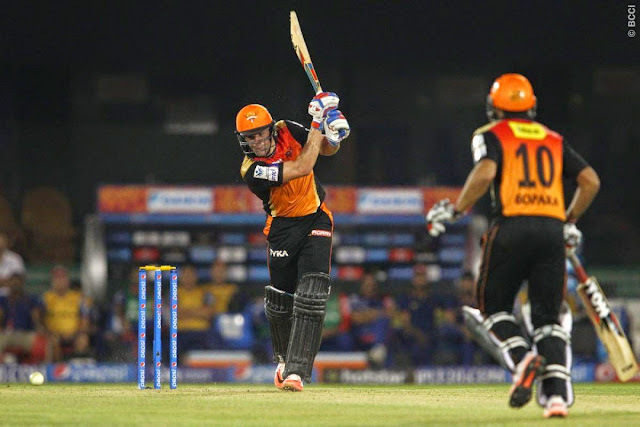 Sunrisers Hyderabad managed to post a target of 164 runs with the help of a solid knock by Moises Henriques of 74 runs of just 46 balls who anchored the entire innings with little help from other partners. Nathan Coulter-Nile was the pick of the bowler who just conceded 25 runs in his quota of 4 hours and also took two wickets and one of those was of the key batsman and Sunrisers Hyderabad captain David Warner. While Zaheer Khan and Jayant Yadav also cheeped in with a wicket each. Chasing an above par target of 164 runs Delhi Daredevils lost the wicket of Shreyas Iyer at the score of 13 runs. While Quinton de Kock, playing his first game of the season looked in sublime form as he clobbered the ball all around the park and reached to his half century in just 28 deliveries but he tried to hit one shot too many and lost his bails to Naman Ojha off the bowling of Karn Sharma and that started the downfall of the Daredevils as it has always happened in this league. They lost three wickets one after another within the phase of three overs and they were soon down to 66 for 4 after 11 overs. But Kedar Jadhav kept Delhi Daredevils in hunt by continuously finding the ropes every now and then and was equally helped by Saurabh Tiwary who gave him enough strike which enabled Jadav to reach to his half century in just 24 balls. Both of the batsmen continued to rotate strike and find a odd boundary in between. The 18th over produced just 7 runs which meant Delhi needed 22 runs in last two overs. The Penultimate over produced only six singles of six deliveries making the target 16 of the last over which was bowled by the experience veteran Ishant Sharma and the first ball of the same was smacked straight down the ground for a boundary. While the next three balls produced only four runs making Delhi needing 8 of 2 deliveries. Which means Delhi needed two boundaries or a six and a couple to seal the deal but the fifth ball just yielded 1 run which meant Delhi needed a six to make the game a 21 over game and to make the crowd enjoy the second super over of the tournament. But the experience of Ishant Sharma came in help as he bowled right into the block hole which made it impossible for Kedar Jadhav to do anything with it. Karn Sharma, Bhuvneshwar Kumar and Parvez Rasool were the most economical and effective bowlers. Karn took 2 wickets for 12 in his three overs while Parvez and Bhuvneshwar managed to take a wicket each for 20 in there quota of four overs. Moises Henriques was judged as the Man of the Match for his Match turning innings of 74 runs. It was a strong performance from Sunrisers Hyderabad but they will like to sort out some issues with their middle order which looks rather pathetic. The bowlers did a good job especially at the depth and didn't allowed the Delhi batsmen to get over the line. Delhi on the other side came close yet again but as always can’t make it count and lost yet another game which they had in their grab till the most part of the match.